Research for innovation is something like the graal, for companies. They are always tempted by stay in their comfortable position, or try to get out of the box and create a new field of business. But that’s not supposed to be easy…And makable. For most of them, innovation stay a wild dream, where they hope for a new easy start, while employees have not really ways to make it real. If we could resume for a short and simple idea, the concept of innovation, “Innovation is a change in the thought process for doing something, or the useful application of new inventions or discoveries. It may refer to an incremental emergent or radical and revolutionary changes in thinking, products, processes, or organizations”. Something simple, shaping and describing the whole circle of play, for considering a thing, action or process could be considered as an innovation. Well it seems so complicated that we understand why it’s so rare and why there is so much “shy” companies to launch anything really “out of the box” that is not only a fake move, test or something aside the “real” business. Innovation is in fact, not a toy, but makes part of the whole company, breathes with it and need a whole change of mindset, but process and operating too. In this simple picture, see how company is in fact struggled between “forces” (no not Porter’s one…), that bury it into complexity and supply lots of reasons to stay in comfortable positions. 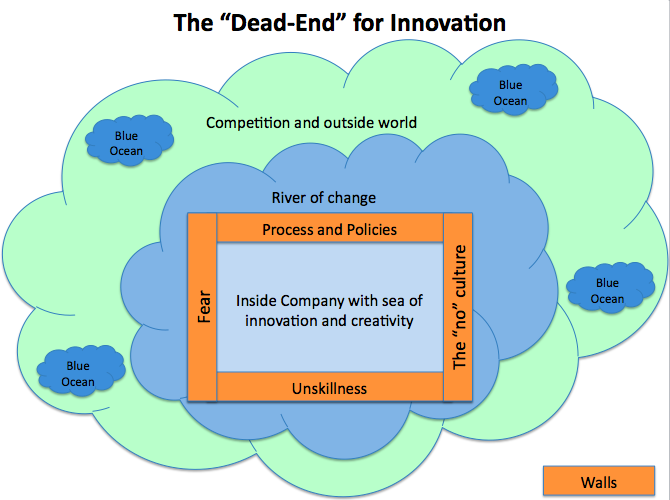 Outside the walls, a certain willingness to move, like a flow that could support innovation and drive motivation…But outside this “river of change”, the hard times with hard competition with tough guys…with the traditional niches with blue oceans, where life is cool and creative…for a while. But seeing inside the walls and considering that this company has motivation and some abilities to innovate, walls keep this whole force inside…Why, how? 1) Process and policies: keeping barriers of justice, legal and rules…Necessary, for sure…but hard to move and make them evolutive and flexible. Managers like them while it’s the best way to say “no”, with no regrets…easy to say no, easier than taking risks and new directions? 4) the “no” school: from any situation, any people will have a defensive reflex saying “no” to unknown. Kind of sport you could fall in love with, a kind of culture for some companies. We can even imagine there’s some hiring programs for “no people” and some training session for those who say “yes” too often…In fact innovation need envy, ambition and positive attitude. Staying beyond the walls, with strong positions only drive to “no”, facing the simple idea of “changing” anything…Chose the “yes” DNA to rise chances of success! I told you from the start how hard could it be, until a conscious and bright path to innovation could born. Unchain what we know, free ideas, collaborative and social power, people just want to express itself and focus energy on “new”. All you have to do is to lead/drive this awesome energy in doing business and brand building, while you’ll be the king of HR improvement. Yes companies have silent forces they prefer ignore because it’s more comfortable and less dangerous, but standing like this won’t lead to manage talents, skills and innovation mindset. All you’ll generate is a twirl in people turnover…giving the best resources to competitors and losing your innovation workforce. Time to harvest and educate the best seeds: prolific leaders will get prolific innovation and loyalty mindsets.